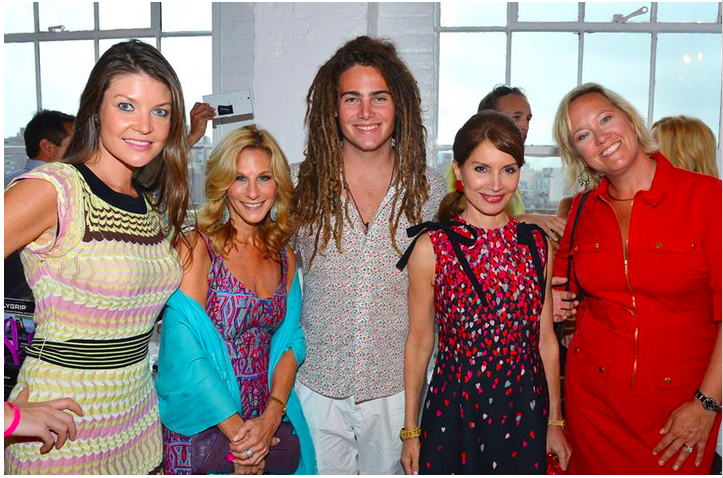 One of the hottest events during New York Fashion Week was the NEXPERT styleXtech event. It brought together the brands that are on the cutting-edge of technology, fashion, lifestyle, digital, and beauty. One of my favorite finds from the event was the FlyGrip. It's my "one-handed smart phone solution" that lets me text, talk, and take photos with effortless ease. The FlyGrips come in multiple colors and designs and fits on the back on your smart phone. You can even use it to prop up your phone on flat surfaces. Check out the full recap below along with photos from the event. at Fashion Week Tech Demo and Mobile Lounge! · From LG, the revolutionary new LG Styler clothing care system, which refreshes clothes at the touch of a button, without harsh detergents, providing an ideal solution for both everyday clothing such as suits, coats and sweaters, as well as hard-to-maintain pieces. Also on view was LG’s revolutionary 65-inch class LG OLED 4K TV with its awe-inspiring perfect blacks and intense color, displaying stunning Fashion Week images and content, tailor-made for the hundreds of discerning attendees on hand. · From Brother, industry-first disruptive technology with THE Dream Machine™ Innov-ís XV8500D embroidery, sewing, quilting and crafting machine - comes equipped with industry-first My Design Center, integrating InnovEye® 2 camera-like technology with up to 2x the scanning speed and up to 3x the resolution than Quattro® and the industry’s largest high-definition built-in high definition 10.1" LCD display. · Also from Brother, the Persona PRS100, a versatile single needle embroidery machine with free arm embroidery, which gives you the flexibility and ease to embroider difficult to reach areas on caps, small t-shirts, sleeves, and much more. · From fitness industry disruptor and trainer-to-the stars Kacy Duke, the live, interactive debut of her ground-breaking new Sculpt & Groove Workout featuring innovative cardio-sculpting moves, exhilarating compound exercises and soul-stirring sound-track. · From ShadeScout™, the cosmetics color search mobile app that enables consumers to find products in the colors that inspire them. A pioneer in augmented reality, FaceCake is reinventing the way people shop for cosmetics by combining its color search technology, signature Virtual Try-On capabilities and built-in purchase features to create a mobile, immersive shopping experience. · From Thync a small portable device that enables the wearer to feel calm or energized on demand. Wear it for just a few minutes and feel the effects for hours. Combining proven neuroscience with groundbreaking technology, Thync users are able to access inherent abilities and achieve more in the course of the day. The effects are similar to a shot of espresso or glass of wine - without ingesting anything. Thync Calm or Energy Vibes are delivered and controlled using an iOS app. · Younique Moodstruck 3D Fiber Lashes giving natural lashes the ultimate beauty boost, an increase in lash volume of up to 400 percent. Brother International Corporation is one of the premier providers of products for the home, home office and office. The U.S. corporate office in Bridgewater, NJ, was established on April 21, 1954 and currently markets many industrial products, home appliances and business products manufactured by its parent company, Brother Industries, Ltd. of Nagoya, Japan. These products include an award-winning line of Multi-Function Center® machines and printers. Brother also provides the number-one line of facsimile machines in the U.S. and is the leader in electronic labeling, with its full line of P- touch® Electronic Labeling Systems. For more information you can visit the website at www.brother-usa.com. NEXTPERT Katlean de Monchy the visionary force responsible for creating the first Mobile Lounge and curating stylextech is recognized for her forward-trending experiential events gathering influencers and top tier media. Next up from NEXTPERT, a celebrity-studded media-party planned for December in Miami during Art Basel; a gathering of disruptors at SouthXSouthwest; and a special Hamptons party in June 2016. And of course, NEXTPERT styleXtech will be back for February 2016 Fashion Week in New York.